Congress will soon return from the August recess and resume consideration of FY 2015 appropriations. As usual at this time of year, there's still quite a bit of work to do to complete the process, especially in the Senate, and limited time before the elections to do it. Senate Appropriations Chair Barbara Mikulski (D-MD) remains interested in a September omnibus that would package all or several bills into one, but the odds seem to favor a continuing resolution to avoid a shutdown and extend current funding through the election, as House Republicans prefer. With all this uncertainty, it's hard to say when appropriations will be finalized, and which recommendations from appropriators will survive any eventual negotiations and work their way into law. And there are still no NIH figures available in the House. But outside of NIH, enough progress has been made to provide a general picture of Congressional preferences for R&D funding in FY 2015. A rundown of the big picture is below, followed by brief agency recaps. The above table breaks down current R&D estimates in nominal dollars, while the below chart shows recent history for the six largest R&D spending bills in constant dollars. These six bills together account for 97 percent of all federal R&D. Note that so far, none of the Senate versions have passed the full chamber, while the full House has approved their Defense, CJS, and Energy and Water bills out of these six. The rest of the figures refer to the latest versions of each bill as amended. 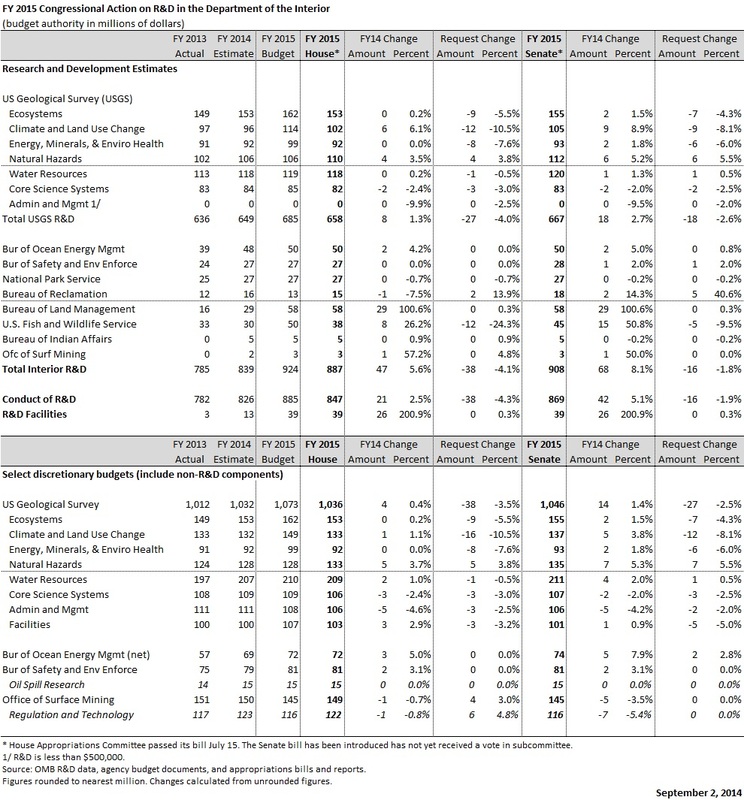 So far, according to AAAS estimates (and excluding Labor-HHS bill spending, which has yet to be unveiled in the House), current House R&D appropriations would result in a 0.8 percent increase from FY 2014 in nominal dollars, while current Senate appropriations would result in just a 0.1 percent increase. Adding in Labor-HHS spending, the Senate increase would rise to 0.7 percent, thanks in part to an increase for NIH. These figures are all below inflation. A few observations. First, R&D spending has followed a pretty similar trajectory across the major bills. The chart at right shows the inflation-adjusted funding history back to FY 2012, the last year before sequestration kicked in. R&D funding in each bill exhibits a big sequester-driven drop in FY 2013, followed by at least a partial recovery for all in FY 2014. For FY 2015, appropriations so far have been generally consistent with that post-sequestration recovery. But even so, the magnitude of recovery varies by bill. 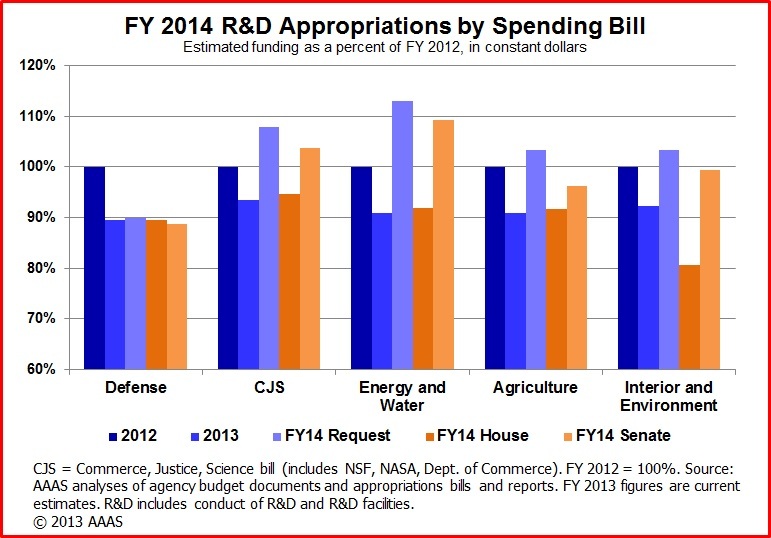 Collective R&D in the CJS, Energy and Water, and Agriculture bills seems set to match or exceed pre-sequester spending. But the recovery in bills dealing with environmental research, health (mainly NIH), and education has lagged. 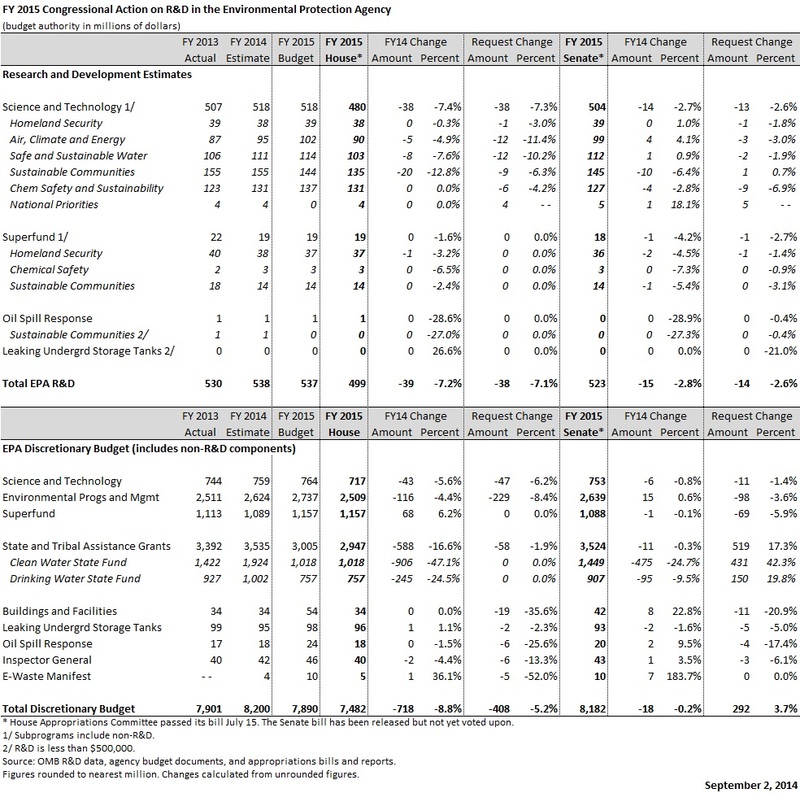 Defense science and technology spending neared pre-sequester levels in FY 2014, but would fall short of that mark in FY 2015 under current appropriations. Downstream technology development funding at DOD (not shown) would remain well below FY 2012 levels. In the aggregate, FY 2015 R&D appropriations are not terribly far apart. This is especially so in comparison to last year's appropriations, when the House and Senate differed on overall discretionary spending levels. This difference led to big gaps in R&D appropriations (see this chart from last August for comparison). The conflict over discretionary spending was resolved in last December's Bipartisan Budget Act, and this agreement has led to the relatively similar outcomes for FY 2015 shown above. This would seem to reinforce the idea that the biggest determinant of the R&D budget tends to be the size of the discretionary budget overall, and to some extent this remains true. However, it's also worth noting that the very modest increases for aggregate R&D would still represent slightly faster growth than the rest of the discretionary budget, which is only slated to increase by 0.2 percent this year. Indeed, R&D in the five major nondefense bills listed above would generally beat this pace by a clear margin in both chambers, suggesting that appropriators with limited fiscal room have prioritized science and innovation to some extent. Lastly, under current appropriations, federal R&D would continue to stagnate as a share of the economy, as it would under the President's original budget request (excluding the largely-ignored Opportunity, Growth, and Security Initiative). Federal R&D in FY 2003, at the end of the NIH budget doubling, stood at 1.04 percent of GDP, but is below 0.8 percent today. Current appropriations and the President's request would both place it around 0.75 percent of GDP in FY 2015. Research alone, excluding development, has declined from 0.47 percent of GDP in FY 2003 to around 0.39 percent today, and current proposals would take it a bit lower, to around 0.37 percent. But while overall appropriations are running along similar lines this year, the aggregate spending numbers obscure some big differences between chambers at the agency, office, and program level. Some of these differences are shown in the agency charts below. Spending Bill: Agriculture (HR 4800 and S 2389); the Forest Service is funded through the Interior and Environment bill. Current progress: The Agriculture bill has been approved by appropriations committees in both chambers. The Administration's request had sought to boost extramural research via the National Institute of Food and Agriculture (NIFA), while trimming intramural research via the Agricultural Research Service (ARS). Appropriators in both chambers have essentially taken the opposite tack, favoring ARS funding over NIFA. The big difference in House and Senate ARS funding (seen at right) is due to an amendment from Rep. Jack Kingston (R-GA) providing $155 million for construction of a new poultry science center in Georgia. All seem to concur on a 2.8 percent funding increase for the competitive Agriculture and Food Research Initiative (AFRI), while agreement varies over funding for the National Agricultural Statistics Service (NASS) and the Economic Research Service (ERS). Lastly, appropriators in both chambers have rejected the Administration's proposal to cut research at the Forest Service, with the Senate committee providing flat funding from FY 2014 and the House committee providing an increase near inflation. Current progress: Approved by full House, and by Senate Appropriations Committee. The two major Commerce R&D funders, the National Oceanic and Atmospheric Administration (NOAA) and the National Institute of Standards and Technology (NIST), were slated for R&D increases by the Administration, and both represent areas of relative difference between the House and Senate. The House has recommended a five percent cut for NOAA's primary research arm, the Office of Oceanic and Atmospheric Research (OAR), primarily due to significant cuts to climate research. Senate appropriators, meanwhile, would grant an increase, but smaller than requested. Funding gaps in other NOAA offices are apparent as well. At NIST, all seem to agree that funding for NIST's laboratory programs should increase, but there are clear differences over NIST's industrial technology programs, particularly the Advanced Manufacturing Technology Consortia program, or AMTech, which would not receive funding in the House bill. : Defense (HR 4870; Senate report); also the Military Construction and Veterans Affairs bill. Appropriators in both chambers have been relatively more generous than the Administration across most DOD science and technology funding accounts; one exception is DARPA funding, though the DARPA budget would still grow faster than inflation in both bills. Another notable development this spring was the Senate boost for Defense basic research. 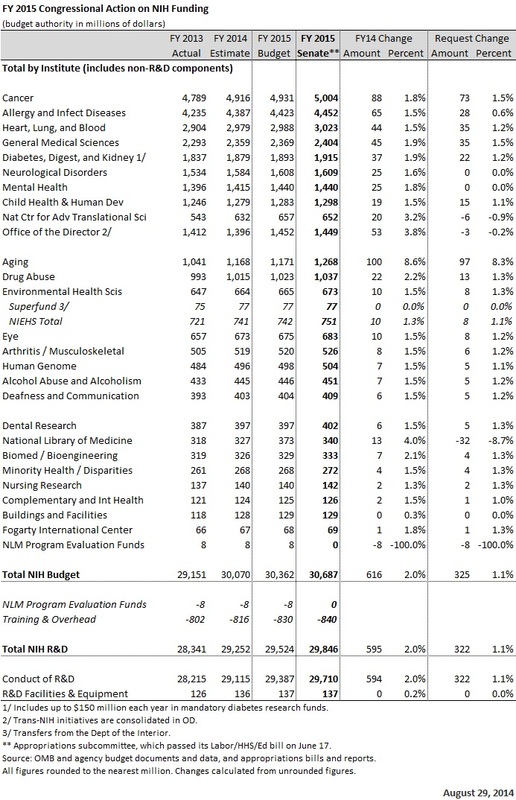 Elsewhere, appropriators in both chambers would make significant cuts from the current year to DOD's medical research programs (not shown in the chart at right). As a result, overall DOD science and technology funding would drop by 3.1 percent in the House bill, and 0.6 percent in the Senate bill. Note that some of the House estimates shown in the chart may be adjusted downward: a House amendment made an unspecified reduction of $69 million to DARPA funding, and this unspecified reduction does not yet show up in the 6.1, 6.2, and 6.3 accounts displayed. Current progress: Approved by full House, and by Senate subcommittee. Senate committee proceedings over the Energy and Water bill were marred by disagreement over the President's climate agenda, and the bill was withdrawn on short notice from the full committee markup due to planned amendments to restrict the regulation of emissions. Overall Office of Science (SC) funding levels would change little in either bill. Appropriators have generally matched or exceeded the request in nuclear physics, computing, and high-energy physics, though the latter program would still receive a cut from FY 2014 levels. Within fusion energy, appropriators in both chambers have expressed skepticism over ITER, the international fusion energy project under construction in France, though House appropriators would give the project time to make necessary managerial improvements, while Senate appropriators would withdraw from the program outright. Environmental research also remains a sticking point for the House. Variation in funding outcomes has also emerged among DOE's energy technology programs, echoing earlier debates. Senate appropriators are more bullish on efficiency, renewables, and grid-related research funding, reflecting major Administration priorities, while the House tends to favor fossil energy R&D. One somewhat surprising outcome is a higher funding recommendation in the House for the Advanced Research Projects Agency-Energy (ARPA-E), due to a favorable floor amendment from Rep. Adam Schiff (D-CA). Current progress: Approved by House Appropriations Committee; released in Senate. The Administration had sought only flat R&D funding for EPA, but it appears they will not receive even that. EPA R&D would be cut by 7.2 percent below FY 2014 levels in the committee-approved House bill, according to current AAAS estimates, while the Senate bill, released shortly before the August recess but yet to be voted upon in subcommittee, would cut R&D by roughly 2.8 percent. EPA's overall science and technology account, including some non-R&D funding, would be cut by 5.6 percent in the House, and 0.8 percent in the current Senate draft. Most notably, of course, the House bill contains several controversial riders to restrict the agency's ability to regulate power plant emissions. See also an updated funding table. Appropriators in both chambers have been more generous to NASA than the Administration, with each adding at least $435 million to the Administration's proposed NASA budget, and at least $221 million to the NASA Science directorate specifically. Appropriators in both chambers have restored funding for the Stratospheric Observatory for Infrared Astronomy (SOFIA). The House remains particularly interested in Europa mission funding, and less willing to fund the Earth Science program and the Administration's asteroid redirect mission. Appropriators in both chambers are also bearish on the Administration's proposed funding boosts for the Space Technology and Space Operations missions, to varying degrees. Particularly acute disagreement continues on the Exploration funding front. Appropriators in both committees have expressed frustration with NASA's requests for Space Launch System and Orion crew vehicle funding, which appropriators feel are continually insufficient (and the House Science Committee has also gotten in on the act: see this recent letter from committee chair Rep. Lamar Smith to NASA Administrator Charles Bolden). The largest relative gap between the chambers appears to be over the Aeronautics directorate, with the House particularly keen on boosting funding there. Spending Bill: Labor, HHS, Education (Draft Senate bill and report); some funding for NIEHS is also contained in the Interior and Environment bill. Current progress: Labor-HHS bill has been approved by Senate subcommittee; yet to be released in House. Much has been written about the NIH funding stagnation in recent years, with current-year R&D funding estimates 11 percent below FY 2003 levels adjusted for inflation. The Administration had requested a sub-inflation R&D increase of 0.9 percent or $272 million in FY 2015, including mandatory diabetes research funding and Dept. of the Interior transfers to the National Institute of Environmental Health Sciences (NIEHS). The largest relative increases in the request were reserved for the National Center for Advancing Translational Sciences (NCATS), the Office of the Director (OD), the National Institute of Mental Health (NIMH), and the National Institute of Neurological Disorders and Stroke (NINDS). House appropriators have yet to unveil their Labor, HHS, Education bill, but the Senate bill, which has been moved through subcommittee, would top the Administration's R&D request by an estimated $322 million, resulting in a two percent or $595 million increase in R&D above FY 2014, and a $616 million increase in overall budget, again including superfund transfers and mandatory funding. The National Institute on Aging would receive the largest increase above FY 2014 levels, at 8.6 percent, while all other institutes would receive at least a 1.3 percent increase. The subcommittee would also match the $100 million request for the interagency BRAIN Initiative. Notably, the subcommittee has recommended reform of the program evaluation set-aside under the Public Health Service (PHS) Act. Typically, most NIH appropriations are subject to a transfer or so-called "evaluation tap," currently set at 2.5 percent, to fund evaluations of the effectiveness of federal health programs. This "tap" funding almost entirely goes to other agencies — for instance, it has fully paid for the Agency for Healthcare Research and Quality — and effectively reduces the amount of funding actually available for NIH research activities. NIH is also the single largest contributor to these funds, given the agency's budget size. The subcommittee would shift funding to convert NIH from a net contributor to a net recipient. According to the subcommittee, NIH would contribute $696 million in transfers, but receive $808 million, good for a net gain of $112 million, to ensure, in the words of appropriators, that "transfers are a benefit to NIH rather than a liability." See an updated funding table for NIH. The Administration had set a modest target for National Science Foundation funding in FY 2015, requesting only a sub-inflation 1.2 percent increase overall, and essentially flat funding for the Research & Related Activities account, NSF's primary research account. The House has topped both figures, notably providing an additional $166 million above the request for the research account. But this increase comes with strings attached. A floor amendment from Science Committee Chair Lamar Smith (R-TX) sought to keep social sciences funding flat from FY 2014 levels. And, House report language indicated that geosciences research is not to receive additional funding above the requested amount. Thus, under these constraints, the other four directorates — covering biology, computing, engineering, and the mathematical and physical sciences — might end up with increases in the realm of three to five percent above FY 2014 levels, depending on how budget allocations play out. The Senate committee attached no such constraints, but also showed funding restraint, matching the overall request and only granting a smaller $30 million increase to the research account. Everyone does seem to agree on equipment and facilities funding, nearly unchanged from FY 2014. Like the Department of Commerce agencies, USGS was among those slated for a larger relative increase under the President's request at 5.5 percent above FY 2014, and a four percent increase in total budget. Appropriators in neither chamber would match these increases, but the draft Senate bill, which has not yet been subject to a subcommittee vote, would get closest. The Senate draft would boost USGS R&D by 2.7 percent according to current AAAS estimates, and the overall budget by 1.4 percent. The House bill would provide only a 1.3 percent increase in R&D, and a 0.4 percent increase in total budget. Natural hazards research is the only area in which appropriators in both chambers have exceeded the request. See an updated funding table for the Department of the Interior.